This was the final day of filming for Magical Mystery Tour at West Malling Air Station in Maidstone, Kent. A ballroom set was constructed in the huge aircraft hanger area, for the film's finale. 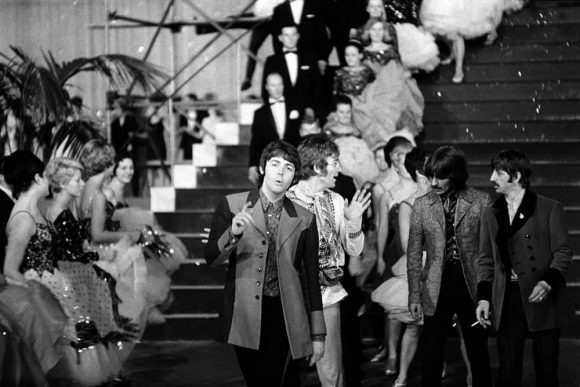 Following lengthy rehearsals, The Beatles were filmed alongside 160 members of Peggy Spencer's formation dance team, miming and dancing to Your Mother Should Know. The Beatles all wore white suits and carnations. Also in the scene were the rest of the cast, and 24 cadets from the West Malling branch of the Women's Royal Air Force. Also on this day, a sequence was filmed in which the coach party, minus The Beatles, cheered and waved for the cameras, another in which the entire cast walked past the camera, and an unused scene in which Ivor Cutler performed a song at a white organ, with contributions from The Beatles and the coach passengers.